If you like SKIING, SNOWBOARDING and all things APRÈS, then Frozen Underground is made just for you. all your favourite winter resorts. Explore the world of Frozen Underground: the only way to snow. Thanks to the recent opening of the Alpine Line extension, travellers can now visit the incredible site of The Battle of the Snowmen via our brand new station at Snowdorf. 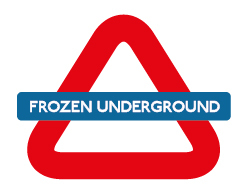 The Frozen Underground collection of music that’s played throughout our network is finally available. Yeti says: "I am not a bear!" The almost forgotten track, with that legendary sax opening, has been uncovered thanks to the discovery of its namesake Frozen Underground station. Winter sports enthusiasts due to take the replacement bus services to St Anton Frozen Underground station are concerned about whether the system will cope during peak season. If you have an apartment, chalet, cabin, home, hütte, bar, cave or hotel (etc.) in the mountains, why not create a station for yourself? Wherever there are mountains, it seems, there are tunnels running underneath them. Intensive studies have revealed that some of the largest subterranean routes were originally created several thousand years ago by the early Yetis in order to make their journeys across mountainous terrain much easier. For reasons yet unknown, it appears as though the tunnels became abandoned and seemingly forgotten somewhere between 2000 BFU (Before Frozen Underground) and 2200 BFU. Their rediscovery started in the summer of 1567 in the quiet lane of Pulverturmweg in the north of Kitzbühel. On 7 July, engineers were digging foundations for the first Hahnenkamm ski lift. It was to be driven by a rudimentary steam turbine (described by Taqi al-Din in 1551) and needed some serious foundations. Without warning, the base of the hole collapsed, and it was clear they had broken through into some kind of cavern underneath. A search party was sent down and they found a tunnel which led upwards at a steep angle towards the north-east. It eventually emerged underneath a hütte on Waldhofweg owned by Anton “Gefahr” Lebkuchen. The marker indicates the location of what became Kitzbühel North-West station and the Lebkuchen Line. The entry station (site of Anton Lebkuchen's Hütte) Kitzbühel North was on Waldhofweg, to the top-right of the map, close to where the word "Kampen" crosses the road. 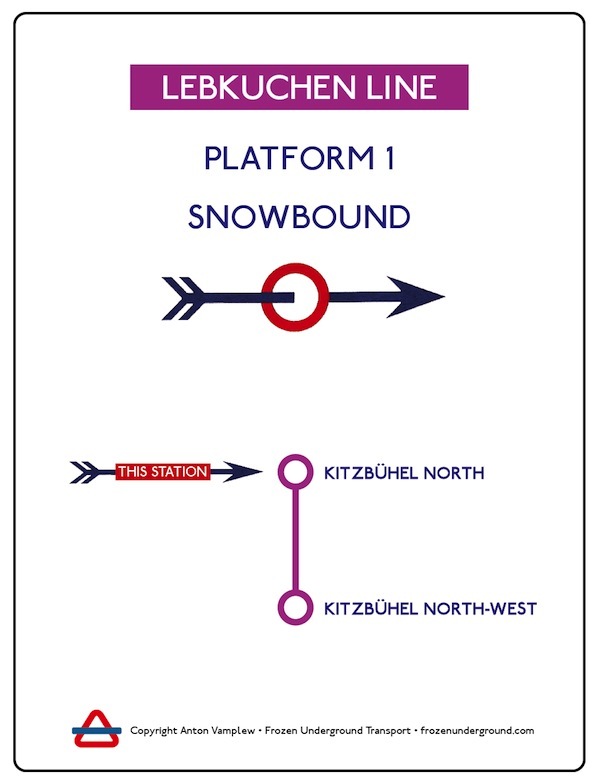 Fun Facts: The now once again abandoned (for extreme safety reasons) Lebkuchen Line holds the records for having both the steepest slope and the shortest track length of any Frozen Underground Line. Anton suggested to the engineers from the Kitzbühel Gemeinde that they could work together, and that his hütte could be the entrance of a subway system taking guests down via “trains” to the newly installed Hahnenkamm steam-driven rope lift. As well as developing this line, Anton set to work researching the surrounding area and, finding tunnels everywhere, realised the potential of taking people skiing to other distant places: The Frozen Underground was born. Back in Kitzbühel, less than six months later, the first ever Frozen Underground line was opened on 2 January 1568. Then, the wooden carts of the Lebkuchen Line, driven by gravity alone and working (not surprisingly) just one way, took winter sports enthusiasts from Kitzbühel North to Kitzbühel North-West, through just 40 metres of tunnel. The station sign at Kitzbühel North. The trains ran for more than 100 years until 1672, when the expansion of the ski area with many more ski lifts made the line redundant. More recent excavations at Kitzbühel North-West have since revealed a very impressive first aid station and a bar, as well as the bottom station of the also disused Hahnenkamm rope lift. As more and more tunnels were discovered, questions began to be asked about their creation and initial purpose. 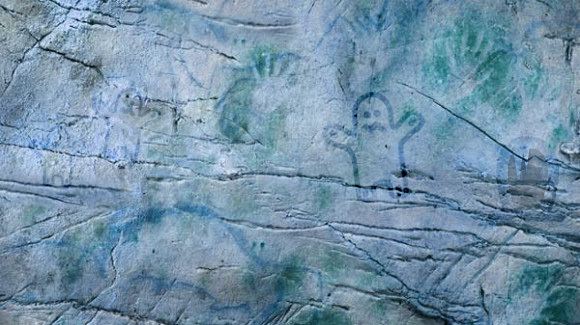 Along many tunnel walls petroglyphs were found, which soon began to reveal the world and life of their builders, the Yeti. Today, the origins of the tunnels are explained fully in the Museum of the Frozen Underground in Snowdorf, Stieglstein. In brief, the subterranean routes were originally created by the early Yeti species Giganto Sapiens Alpina, with the purpose of speeding up their journeys through the mountainous terrain. The size of the Yeti meant, for comfort of travelling, they had made the tunnels fairly large, with many “stops” along the route. These were their original access ways to the surface. Markings on the rocky walls at these “stops” suggest they were used as coffee bars and meeting places for relaxation before continuing on their long trek – some of the modern-day stations are hundreds of miles apart. Not surprisingly, ancient settlements tended to cluster around these "stops" that have grown into the ski resorts of today. Therefore we reach the undeniable conclusion that the Yeti are responsible for where we ski! Cave drawings in many tunnels show what we know to be pictorial representations of the Yetis who carved out the routes through the mountains.